Brand new 60 Qt. 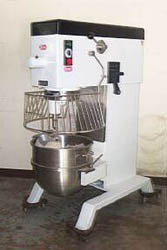 Berkel Mixer with 2 hp motor, 3 Speeds, timing belt driven with planetary gear box. 208 to 240 capable electric. Comes with mixing bowl, dough hook, and paddle. Weight approx. 600 lbs.